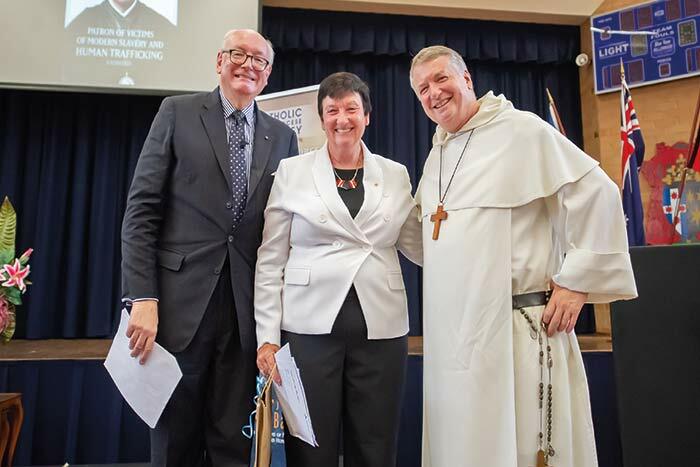 To commemorate the International Day of Prayer and Awareness Against Trafficking in Persons on the feast day of St Josphine Bakhita (1869-1947) the Catholic Archdiocese of Sydney Anti-Slavery Task Force sponsored an Ethical Sourcing Seminar and Expo. Over 250 participants including suppliers of goods and services to the Catholic Church entities, government and business leaders came together to learn about new Modern Slavery legislation and what steps need to be taken to eradicate modern slavery. Archbishop Anthony Fisher informed the gathering that the anti-slavery taskforce has in principle commitments throughout the archdiocese, from church agencies, education and healthcare providers, along with parish priests “to seek to remove the stain of slavery from our Archdiocesan procurement practices”. Chief Executive of the Business Council of Australia, Jennifer Westacott, made an impassioned plea on behalf of those “on the wrong side of the ledger; those with no control over their lives or their circumstances”. This far-reaching framework, which is now being implemented, seeks to bring about change in the areas where the Church has the most capacity to do so.